It is really disappointing to see the current plight of standalone clubs in the VFL. We have seen a couple of clubs go under in recent years. Other sides are hanging on for dear life. Reports have emerged that the proud Port Melbourne Football Club are in a battle to stay afloat, with increasing debts of around $300,000. It is terrible that a 143-year-old club that has achieved, and continues to achieve, plenty of on-field success finds itself in such a precarious position. The Frankston Football Club – a club that has existed since 1887 – is in a current hiatus due to financial difficulties. It is imperative that these standalone clubs (Port Melbourne, Frankston, Williamstown, North Ballarat and Coburg) survive for the betterment of state league football. Each of these clubs has its own rich and unique culture and history. As a listed player for the Bendigo Football Club in 2014, I saw firsthand the effects a folding club has on not only the players, but the coaches, volunteers and supporters. Unlike Port Melbourne, the Gold did not achieve on-field success, but the club certainly had heart and soul. It had volunteers that gave up so much of their precious time to be the first to arrive and last to leave trainings, doing everything they could to help the club. It had its passionate supporters that were front and centre of every quarter and three-quarter-time coach’s address, braving the blisteringly cold weather and wearing the navy blue and gold club colours. But like many other standalone VFL clubs, the Gold could simply not compete with the financially strong AFL-aligned opposition clubs. 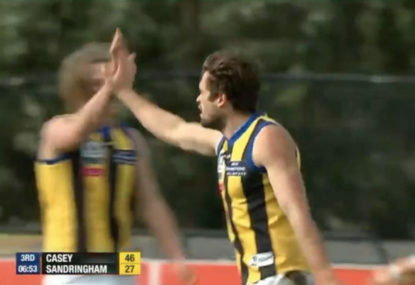 A symbolism of the club’s culture took place in June of its final season in the VFL – right when the club was at rock bottom. Before training on typically chilly Wednesday night in Bendigo, the playing group was told of the decision to terminate the club’s VFL licence. It was an emotional time for some players and to compound issues, the club’s training ground, the Queen Elizabeth Oval, was unavailable to train on. But instead of calling it a night, the players jogged down to a local park near the ground and conducted a training session under the dimly-lit light posts. We had to contend with the lack of light, low-lying branches, inconveniently placed trees and I couldn’t help but think of the contrast in training conditions between the Gold and its opposition. But despite all this, it was still fun; the club was under-resourced, yet still maintained a positive atmosphere due to the unyielding mateship that the group had. Unfortunately, the long-term viability of football clubs at state-league level is determined by the almighty dollar and I fear that we will see more proud clubs disband because of this.